Someone please explain to me why it is customary for fans of some sports to remain totally silent while in other sports they can make as much noise as possible. Take tennis, for example. Prior to the serve, the fans are as quiet as a gaggle of dead mimes. If anyone so much as exhales, the announcer fires-up the P/A system to boom out “QUIET, PLEASE”. I have asked many tennis fans to explain this phenomena. Most believe that playing tennis requires so much concentration that absolute silence is mandatory. OK. Let’s compare tennis to another sport where fans traditionally create as much bedlam as a small thermonuclear explosion…… say, Indy car racing. At the Indy 500, a driver is hurled toward a steel reinforced concrete wall at the end of every straight at 200 mph, while being strapped into a tiny, claustrophobia-inducing cockpit, surrounded by 20 gallons of high octane gasoline. The roar of the 400,000 fans is barely audible – being drowned out by the 700 hp, unmuffled engine just 4 inches away. Accidents happen – drivers die. I have been unable to find a reference to anyone being killed during a tennis match. True, a served ball can travel at 120 mph or more, but the ball is a fuzzy little air-filled thing and the opponent has a racquet, roughly the size of a pizza box, with which to defend himself. So which would you imagine requires more concentration and thus, fan silence? Fuzzy air-filled thing coming at you at 120mph or a concrete wall coming at you at 200mph while you’re in a gasoline filled thing? And what about golf? This sport even has a couple of dozen geriatrics stationed on each tee to hold up little cardboard “QUIET” signs. I’ve even seen Tiger Woods freak-out when he heard the click of a photographer’s camera. Woods must have the concentration capacity of a three year old with a sugar rush. How hard is to hit a ball THAT’S NOT EVEN MOVING!?!? Every baseball player in the country can only look on with envy. Yet, wussy golf pros demand total silence while baseball players must concentrate on a ball as hard as a chunk of granite, being hurled at them at 95 mph, with 45,000 fans screaming in their ear. As with tennis, I can find no reference to a single fatality in golf, except for the chain-smoking lard-butts that croak in their golf carts. It seems that the safer the sport, the more fan silence is demanded. Tennis and golf pros need to man-up and quit whining about noise. Maybe a couple of years in the National Hockey League would do these girlie-men some good. There are, however, several golf pros that I consider real men. John Daly, for example, is my kind of golf pro. With Daly in a tournament, there is at least, the possibility of gunfire. when you need to buck the system? Yet another reason to outlaw booze in favor of legalizing pot (a modern approach to prohibition)! 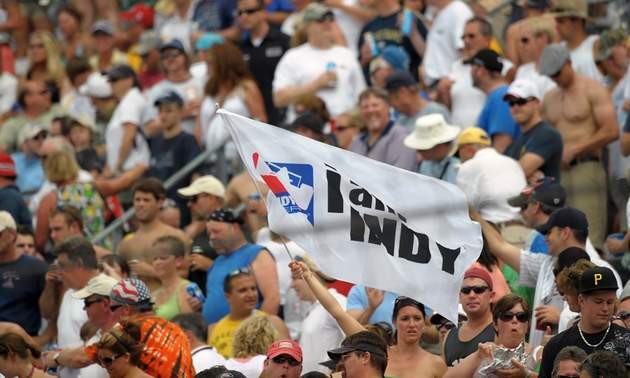 Imagine a quarter of a million people at Indy or the insane crowds bent on killing each other at a soccer match all together chanting WOWWWWWWWWW in a calm, pleasing and melodic tone .. it would totally change the sports (and maybe even cure a few Bubba’s and man-slaughterers). There seems to be a direct relationship between the amount of booze drunk at a sporting event and the noise level. If we require the fans to throw down shots after each serve, this will change the entite face of the match before the end of the first set, trust me on this one. Apparently you don’t understand…all the answers are in the “fried chicken legs” race fans eat while washing down with nice cold beverages! !